Johns Hopkins Medicine researchers report that a program designed to enhance self-care and lead to more seamless management of chronic obstructive pulmonary disease in adults successfully reduced rates of emergency room visits and hospitalization, and the burdensome symptoms and limitations caused by the condition. Cases of cancer and hypertension are much higher among Inuit living in and around Ottawa than for the general population of Canada's capital city. Abnormal levels of more than two dozen metabolites -; chemicals produced in the body as it breaks down fats, proteins and carbohydrates -; can reliably predict which Sept. 11 firefighters developed lung disease and which did not, a new analysis shows. 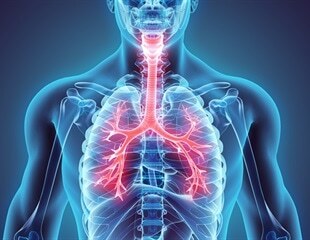 Autoimmunity plays a role in the development of chronic obstructive pulmonary disease (COPD), according to a study led by Georgia State University and Vanderbilt University Medical Center that analyzed human genome information stored in Vanderbilt's DNA biobank. According to latest research vaping using e-cigarettes can hasten the death of lung cells by up to fifty times and cause serious lung diseases later in life. This latest study was published in the journal Thorax. Research published in the journal Clinical Science suggests that an immune signaling protein called interleukin-26 is increased among chronic smokers with lung disease and this involvement reveals disease mechanisms of interest for developing more effective therapy for these hard-to-treat patients. The study was a cooperative effort between the team headed by assistant professor Dr Jürgen Knobloch from the Medical Clinic III for Pneumology, Sleep and Respiratory Medicine at the Bergmannsheil University Hospital in Bochum, Germany, and Prof Dr Andrea Koch, member of the German Center for Lung Research, previously in Bochum, now at the Medical Clinic V for Pneumology at the LMU University Hospital in Munich, as well as a team from the company RespiVert Ltd, a subsidiary of Janssen Biotech Inc., and Prof Dr Erich Stoelben from the Lung Clinic in Köln-Merheim.